It's almost a year since I last drove to work. The move from an office far from the fringes of the city's metro network to an office smack at its core definitely was a decisive factor. Equally decisive is the fact that I absolutely adore commuting to work by metro. 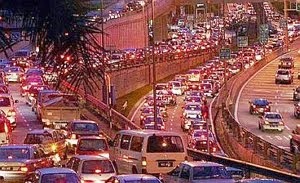 However, the same can't be said to most urban dwellers in Kuala Lumpur. If given the choice, they would rather drive to work. Even if the metro station is a short drive away from home. Even if the office is walking distance from the metro station. That stubborn thinking has to change. Stop being a baby. Time to grow up. There's more to gain from commuting by public transport than to lose. It's amazing how much precious time drivers waste on the road. About two hours a day on average. Being stuck in a jam. Bumper-to-bumper. Crawling as fast as a tortoise chasing down a cabbage leaf. Fuming and cursing all the way. Reaching office, then spending another five to ten minutes weaving around the parking lot. I could drive to work, yes. But it takes me about thirty minutes longer to and fro (which could stretch to an hour, during rush hours). And when I'm in the train, I can freely reply to emails, chat with friends and catch up on reading. I can't exactly do all that when I'm driving - it's illegal, unsafe and distracting. The best thing about the metro is that they're almost always on time, and pass by even more frequently during rush hour when the queues are long. Which means that there is not much difference whether you leave office at five or six - you'll still take the same travel time to reach home. Whereas if you're driving, a slight five minute delay in exiting the parking lot can multiply the travel time by double on the road later on. Also, Kuala Lumpur is prone to heavy tropical downpour. Floods clogged roads. But they hardly ever stop a train from merrily choo-choo-ing down a track. Less time wasted. Travelling time maximised on other tasks. More flexibility in timing. What's there not to like about taking the train? Driving is stressful. We have to constantly stay alert, even in a crawl. Keep our eyes on the road and cars. Can't let our thoughts wander off too much, lest we crash into the car in front or graze a kerb. When we are not in the driver's seat, our minds are free from a major worry. We can start planning the day ahead on the way to work. Aside from the rare breakdown and being squished against someone's smelly armpit in a crowded carriage, you generally arrive at work in good spirits. Driving makes us lazy, too. It makes us feel more attached to our cars than our legs. Look around your office. Chances are, the people who drive to work are the same people who drives out to lunch, even if the restaurant is a few blocks away. They're afraid of being exposed to UV rays, ruining their good shoes, and so on. When we hop onto the metro, there's bound to be some minimum walking involved everyday, especially from the station to office. Gradually, we grow to enjoy the walk, even during lunch time. Commuting by metro makes you walk and sweat. For urban dwellers, who are stuck to our chairs in front of a computer monitor for most weekdays, we need the walk and sweat. Doesn't take a financial whiz to know that public transportation is by far the cheapest option of travel. The infrastructure is funded by the government, fares cost a few bucks, and regular commuters save on discounted monthly passes. For drivers, the cost is higher - fuel prices are rising and subsidies decreasing, parking spaces are scarce and exorbitant in the commercial hubs, and the mileage takes a toll on the car maintenance. Not much else to add here. Who doesn't want to save money? Fine, you don't mind wasting time behind the wheel and having your own personal karaoke with the car stereo. Fine, you gym three times a week after work. Fine, you're rich and you've got a garage full of sports cars. But it's not just about you. Think about the environment. Think about the future generations. Think about the world. The urge to drive is a cultural malaise. Rich or poor, most people in thriving metropolis, like New York, London and Tokyo, are fine with walking and taking the subway. It's not so much an enforced humbling experience. They just accept it as part of the urban lifestyle. They want efficiency. It's in their interest that town planning restricts road usage and promotes public transportation, so that it eases their commuting to work from the city outskirts. And they do acknowledge the dangers of excessive carbon emission and global warming. It is no coincidence that cities and countries with developed metro system are leaders in environmental regulatory reforms. The collective will is loud and clear: we need to consume less fossil fuel. Driving is polluting. Don't be a needless polluter. This is how the future should look like. Embrace it. In a few years time, Kuala Lumpur's metro lines will be extended to reach most established suburban areas. This should silence excuses on lack of connectivity. Still, whether this will actually encourage more residents to leave their cars at home or the metro stations is anybody's guess. It is common to hear of people placing their name on the waiting list for corporate parking in KLCC, where the present metro line runs directly underneath, only to receive a call that space is finally available from the parking attendants a few years later, long after they have stopped working there. It would truly be a shame if the tussle for parking spaces does not shift from KLCC and the city centre to the new metro stations, in times to come. Remember, whenever you're driving, you're not stuck in traffic. 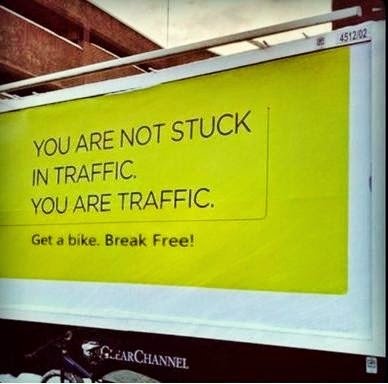 You are traffic!